Darin Olien, founder of SuperLife, is often called “the Indiana Jones of superfoods.” He is a widely recognized exotic superfoods hunter, supplement formulator, and environmental activist who has been around the world and back again on numerous remote field missions to source and research the world’s greatest edible food sources for optimal health. Today, Darin is a renowned authority on nutrition, hydration and the potency of foods and herbs, having successfully sourced more than 300 foods and ingredients from around the world. 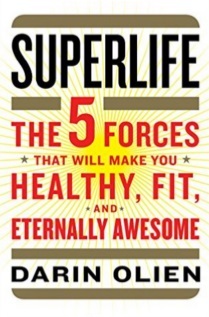 His new book, SuperLife: The 5 Forces That Will Make You Healthy, Fit, and Eternally Awesome, offers resources for simple lifestyle changes to help you eat healthy, exercise effectively, and experience your best life possible — a SuperLife. This book offers a life-changing — possibly even life-saving — message that Darin has been working 20+ years to bring to the world through his global travel and research. I let curiosity lead my pursuits. Everything that has been successful in my life is because I listened to a desire within me and then, most importantly, took action on it. The road is not necessarily clear until you take action, which reveals the next steps and choice(s) to make. That’s the scary part, but I am not afraid of taking action on an inspiration. I believe all good and long-lasting inventions and creations come from that willingness. One of the most successful herbal and superfood blends, Shakeology, came about that way. I don’t put that type of pressure on myself to “be the best.” I just always do my best. We all have our unique view of the world and our own expression. If we own that and put it out in the world in the best way we know, then that is truly doing your best. Breaking the seduction of normalcy and having the courage to leave my small hometown in Minnesota. Most people don’t ever leave. That single win started a lifetime of adventure and unfathomable personal growth. Personal: To constantly uncover what I desire to be and to strive for joy and loving connections with friends, the No. 1 being my wife. Business: To be involved in and create ventures that empower people to be healthy on every level. In the immediate future I am focused on creating sustainable housing that enables a full, healthy ecosystem for people to thrive in. The more I learn, the more I know that health is built on food and the environment you choose to live in. Most recently? Trying to get out of remote, mountainous China while superfood hunting. We were speeding down rugged terrain in nasty weather trying to stay ahead of flash floods and mountain sides sliding down on roads. There were some narrow misses, but we made it out. Take 100% responsibility for yourself and your life. Attitude is the 6th Life Force and I really should write a whole book about it. It is the great differentiator. My wife for sure, my dad, who was one of my biggest supporters hands down. And all people that have come in my life; the shamans, researchers, educators, teachers, workout buddies, and a list that’s far too long. Anywhere I can learn something new! My home is awesome with my wife — a sanctuary indeed. And every far off land I have travelled too has a special place in my heart as well. Shakeology. Focused Energy Boosts (Both some great herbal tonics I happened to make!). Creating sustainable, truly healthy housing opportunities for people through a new venture with Fortis Groep NV. And superfood exploration is an ongoing love…currently in remote China and western Africa.